Charles James (1906-1978) created this jacket for Mrs Oliver Burr Jennings. In 1975 he wrote a full description of the development of its design. It was constructed in the same manner as an eiderdown bed quilt. In certain areas of the garment there was a danger that the thickness would impede movement. James resolved this by diminishing the depth of the padding around the neckline and armholes. This jacket ranks among his most important works, along with the taxi dress and the Sylphide gown. 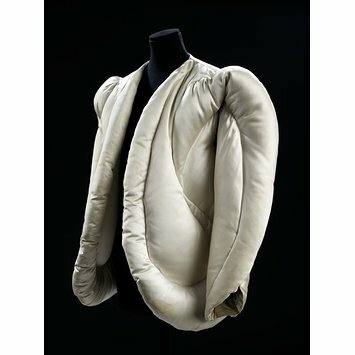 It became a cult object in the 1970s, linked with voluminous padded coats. James longed for it to be translated into other materials - an expensive version in kid leather, for example, or a mass-market example in nylon stuffed with kapok for motorcycle- or ski-wear. Although he was born in Britain, James worked as a milliner and custom dressmaker in New York between 1924 and 1929. In 1929 he opened premises in London. During the early 1930s he travelled extensively between London and Paris, establishing a Paris branch in 1934. Like Elsa Schiaparelli he was a friend of the Surrealist painter Salvador Dalí (1904-1989), and made use of Surrealist influences in his designs. Collarless evening jacket without fastenings. It is hip length and has long sleeves. It is made of white satin and is constructed in a series of quilted curves filled with down. The fronts curve away from each other and the down filling makes them stand away from the body. Two curves stand over the shoulders and continue down the sleeves to the slit cuffs, giving an exaggerated epaulette effect. The back has a curved bottom edge, a centre back seam and a quilted pattern of curves and a heart. "The stitching which held the shaped masses of eiderdown in place, being treated as scrolls or, as in the case of my coat as tapered arabesques, one within another. The stitching however had to be worked out with the cut... This is done while the pattern lies in pieces after it has been first planned.... The great problem in the development of this concept was that it concerned the expansion of the silhouette by inflation with eiderdown which in some areas would be three inches thick at least." The thickness of the jacket padding is reduced around the neckline and armholes to enable unimpeded movement. The sleeves are cut as one with the front panels and have underarm gussets. 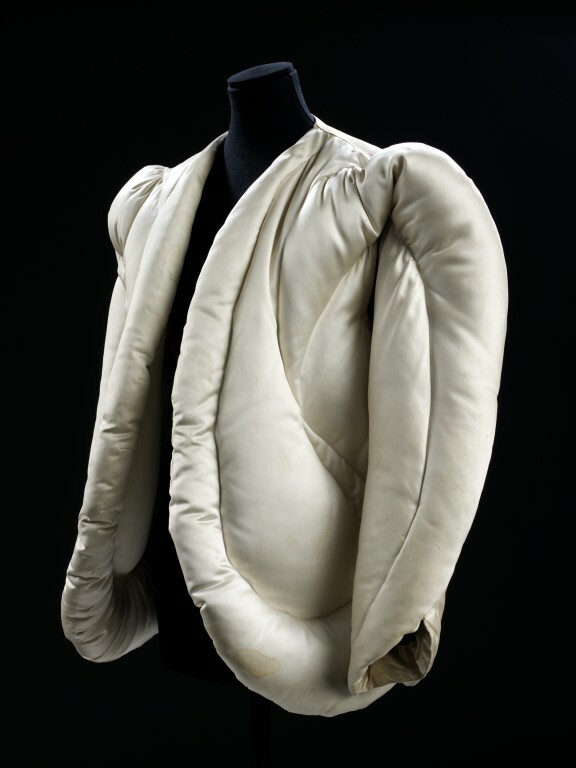 In the 1970s this jacket became a cult object associated with the trend for padded coats and jackets, and Charles James in 1975 expressed his wish for it to be translated into other materials, such as a high end, expensive version in glove-leather, or a mass market example in "NYLON stuffed with foam rubber, or better kapok, or whatever has taken the place of KAPOK and 'marketed' for ski wear, use on motor bicycles etc, at a low price."